as children age to the latter part of grammar school Korean parents consider buying them one, more so in order of protection, even when Korea is considered a safe place for children and adults alike compared to other developed nations . for starters : Cell Phone is NOT cheap in Korea, especially the latest ones with unbelievable gadgetry . as with other parts of the world, buying a cellphone is two-folds : selecting a carrier and the maker of hardware . with the exception of KT, where your regional Telephone Company Office would handle inquiries, all the carriers operate a Customer Center in major cities and in the case of Seoul : several . I strongly urge everyone to visit one to ask directly about acquiring a new service in a strange land, clearing everything on-the-spot instead of calling for inquiries, or asking around other expatriats . preferably with a Korean-speaking friend, although at directly operated branches you will find a clerk who speak English . one big factor in doing ANYTHING in Korea, is whether you have been invited from your employer to work here legally or a school for study, in which case you will be offered an Alien Registration Card AND number, required for foreigners staying in Korea over 90 days . with this, you can subscribe to any Carrier just like any Korean would . without this however, prepaid is your only option, for temporary stay . the only exception here would be airport rentals for those visiting casually, intended for much shorter periods . in this case of a few days up to a month : try to rent when you arrive at the airport from either SKT or KTF, instead of getting one in advance at your point of departure – where chances are Caller-ID in Korea won’t work : frustrating your callers in Korea especially if visiting on business . when trying to decide which Carrier to subscribe to, the order I mention the companies above says it all : the higher the hierarchy, the more relay stations they have, thus more clarity, and more prompt support . as an example : all these companies will install a signal-booster – a wall plug-in device with negligible electric fee – for free if your room is in a blank spot where reception is low . if you call them to request this service, SKT will be there the next day, while you’ll hear from other carriers a few days after to over a month, duh . so why don’t everyone use the one service ? it is because these companies have been here for a while BEFORE getting into the TeleCommunications business and different people have different stigma attached on using them . add to this : different carriers attach different “starting rates” when buying a phone depending upon different times of the year . they will also dictate if you will be able to “exchange” to a new phone or have to subscribe new from scratch . again shown in the order of more number of phones they produce so the merit is evident, where I should add the numbers reduce dramatically each level above . here, the design plays a big role when selecting . adding to it : each maker has a different approach to typing-in Korean characters(copy-righted by each) which is of much importance when a large portion of student life here is dedicated to messaging via Cell Phone (and for extremists : cheating on exams). with your budget on arrival, and as most old-timers : you will be tempted to buy the cheapest phone on the market . good for you, for a while say .. 3 months, hereafter your excuse as the “new guy in town” run out, and locals around you look at you in a strange way : not so much as the “poor” lad, but how backwards mentality you have – especially if you are from an advanced nation such as the U.S.of A.
yeah, you’re just gonna be in town for a while, and don’t care for such stuff .. but this is a monotone country, long~ has been, where everyone was pretty much the same, so everyone looking over to see what the other is doing . people are conscious of others, even if they don’t “seem” to recognize you in the subway . so buy the best one you can afford, with as much gadgetry as possible, for this IS the No.1 Cell Phone Nation in the world today and you might as well enjoy it before going back to enjoy other things at your next destination . I should add here the Japanese Cell Phones are as much developed but gearing more towards connecting to Post Board Communities where Korean ones are heading towards Video Conferencing .. a different approach due to difference mostly on on-line activities of the young . my second advice .. more of a caution, comes when buying a used phone, perhaps from another Expatriat who is leaving the country . make sure you both meet in an official branch office of the TeleCommunications company, and have the clerk check there is no outstanding payment on the Cell Phone . you have to be certain that this hardware is actually free of any payments . then, change it into your name and pay . and do NOT accept a phone if someone just “gives” it to you saying it is free, as they suddenly have to leave the country . you won’t be able to change the owner name on your own . I say this because this “sudden flight” is not too uncommon, especially because crackdowns on teaching with fake degrees are more periodical since the recent art-dealer scandal . notable for a nation of high-technology, especially the young here are obsessed with getting the latest popular phone (after which is the compact digital camera), which usually tops over W800,000 . TeleCommunications companies have worked around this to offer half payment up-front and the rest in monthly calling fees, but still Cell Phones are one tech.item not worthy of buying new as it hits stores . but as I have mentioned on other products, buying a popular model is vital, to insure a quick sale when you have to leave the country . so buy a popular model that was out six months ago or even last year, new or a used one . aside from checking any outstanding payments connected with the phone, it does not matter as much whether the phone is working 100% or even outer scratches . this is because most of the hardware manufacturers are large conglomerates with ample Support Centers nation-wide and will fix it to work for no charge, and exchange the casing for extra fee . you can verify when purchasing, but Cell Phones are one unique category in Korea, where the TeleCommunications Company will exchange or reimburse, through the selling office, your full purchase price should ANYTHING go wrong within 2 weeks of usage . changing numbers only on your old phone – is almost the most expensive : for full retail value of the phone . I should add here that a Cell Phone comes with a certain Carrier and that there is a way around the “new subscription” if you are one of those people who HAS keep buying the latest phone thus, keeping your old number : it is called “aging” in the TeleCommunications business where a few seller might occasionally offer in order to lure nerdy customers (in which case your FIRST phone you registered with this number HAS to have been with this TeleCommunications company). here we’re dealing with what kind of monthly rates you subscribe to, and what sort of options like messaging you pick for yourself . and no, I cannot mention ALL of it here but it is kinda fun that the different TeleCommunications Companies have slightly different rates & options . one option I like on SKT is their SMS option where all of your incoming message is backed-up in their server . and one I like on KTF is their “secretary” service where a third person would actually receive your calls for you . if you are fortunate enough to have a temporary Citizen ID and number you can register at their Internet site and pick all these endless choices one-by-one yourself, while if you don’t have access to this you have to do this while consulting with the clerk at the TeleCommunications Office . but a clerk at a branch office would not kindly help you on these because they are interested mostly on sales, so head over to their few Membership Office where they are exactly there for : to aid users, and more chances of speaking English : usually a large lobby where you can linger on, with a few computers to access Internet and watch TV, then about half a dozen not-too-busy consulting clerks at your service . currently telecommunications companies give the best price slack on-line shopping malls so this is the place with best discounts . but there are some vendors out there still giving competitive price by carefully putting in a option at purchase to be cancelled automatically after a basic period like a month or 3 . this takes time and trying many, many vendors for that tint of good will noticeable through language barrier . this should NOT be confused with a manic seller trying to slide in extra options so that they will get extra commission from . first, you will NOT find them where floor-full of cell phone vendors are crammed in one of the electronics districts or rather buildings . but a branch or store in a local neighborhood because they get repeated customers coming back . differentiate now : a branch is where they sell any makers machines subscribed to a specific carrier, while a vendor sell any mix of hardware AND carriers . in my experience the chances are somewhat more with a branch . at a busy subway or on a major crossing on the road you are bound to see girls in jumpsuits trying to attract new subscribers . if you are a stranger and have to buy the phone with everything prepaid, you would know what you are paying for, but watch-out otherwise . for those independent sellers cannot be trusted because you don’t know what extra options they might stick into your clause . 2. reviewing a mobile community such as Cetizen.com mention on the middle of this page, where also you can see release dates but also the number of reviews AND comments on each phone . the idea is to select a phone that tickles your fancy within the first 3 pages, but the first page is better . then buy it from an Internet Shopping Mall, preferably run by a conglomerate, which is the cheapest place to buy in all of Korea . or before-hand you might want to varify monthly terms at a telecommunications branch operated directly by the company called “Jig-Young-Jum” (directly operated) instead of a “Ji-Jum” (branch office). they sell strictly on official prices but they will tell you what is and is not . their official sites give detailed spots of which branch is where on a Korean map . it is hard to believe even for a techie like me to see how the mobile, telecommunication scene has changed in South Korea in just over a year . first-off : since the posting of this original information Page last January, KTF cell-phone carrier has merged into KT Telecommunications the land-line telephone company in March 2009 . what this adds to confusion for the strange user is that although all the billboards have changed into ONE company name the former KTF branches still takes care of mostly cell-phones including 3G, while original KT buildings care for land-line and Wi-Fi . so in my BLog I will still separate the two by their former name . then it is how SamSung cell phones gave way to Apple iPhone and immediately following is the whole iPad AND MacBook Air . last January was when all the hype surrounding “Boys Over Flowers” cell phone in AnyCall W750 was merely announced whose hype was gradually turned over to figure-skating idol Yuna Kim’s ad-touted W7700 . this was the epidome of thin, rectangle-shaped full-screen LCD cell phones which was a step-up from the miniscule-LCD cell phones with over-all oval design graspable in a single hand . ofcourse in the actual consumer history of cell phone use in South Korea : Motorola was the one to buy mid 1990’s when only businessmen carried them while the young were addicted to beepers – still Motorola as their favourite . then gradually SamSung AnyCall Brand took over with a short-lived sleek design popularity on Sky cell phones . SamSung held the crown with much popular ads starring current idols including Jeon, JeeHyun for another popuplar “MiniSkirt” cell phone in C220 of 2007 . SmartPhone, sort of a ultra mini Pocket-PC computer contained in a cell phone has been in South Korea since the Millennium but mostly caught up by mania’s . during Apple iPhone 3G’s first introduction into South Korea late last year people still were looking at it side-by-side with the still more popular SamSung AnyCalls but it really started taking storm with iPhone 4 mid this year and iPad . so much so, that even nationalism – strong in a nation ruled by foreign powers as well as military dictatorship – couldn’t keep SamSung AnyCalls from ruling still . a good example is that on the many, many on-line post-boards where there is mention of Hitachi or Sony laptops or notebooks everyone would quiet down if someone mentions SamSung or LG is the way to go true /Korean/ users . but now : anyone insisting they all use Korean products on an Apple on-line community would get neglected as an old-timer and would get reminded times-over that SamSung learn from Apple . also there is TWO kinds of contradicting flow~ at work here going from SamSung AnyCalls towards Apple iPhones . simply put : Apple interface is against the Korean psyche . meaning, Koreans who had to live from scratch after the War and had to do long~ time putting up bits and pieces of computer parts AND copied illegal software, feel more easy transfering files themselves than syncing, shown from early users of Palm Pilots which landed in 1996 . but specifically /because/ it is against the genuine Korean flow, people may be yearning towards it to catch it as a trend – which counts mighty important among a culture of similar jobs AND hobbies . 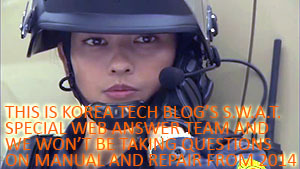 besides, did I say that things change over a year now in South Korea for cell phones ? well, it is getting more like a month . for while full-screen SamSung AnyCall touch phones WERE the ones to get last year in 2009, this year Apple iPhone 3GS started to attract attention, while HTC Google Nexus One was a temporary star during the Summer of 2010 while iPhone 4 was waiting at the docks then a whole grab-it phenomenon in Fall . all-the-while much younger and older user who couldn’t care less or didn’t know how, took solace in SamSung Galaxies . but now come December suddely everyone want the heavy HTC Desire HD with larger screen but still short battery life AND clumsy outer finishing . and looming onto New Years 2011 are Dual Core cell phones to take the spotlight . read my : 2010 Consumer Technology Wrap-Up in Retrospect . So nice of you to put this kind of tutorial on the web. I’m about to make the trip (teaching English for a year…at least), and this will become invaluable as it’s actually somewhat difficult to come across this sort of information in English. It wasn’t until I typed “hand-uh-pon” (in Korean, and subsequently came across your site searching the model numbers from Samsung’s Korean site) that I could find much info about anything to do with Korean handsets and carriers. In short, thanks. Thank you very much for thie Tutorial, it helped me a lot. Im currently trying to find out the top 30 Devices in Korea used for mobile browsing and this blog helped me to understand how it works in Korea. Why there are usually three different names for the devices depending on the Provider. Hi my name is vinay and iam from fiji , im really interested in buying one apple iphone but i just want to know the price how much will it cost me in fijian dollars , m really interested in buying the 3 generation apple iphone. so please if you can forward me with your kind reply which m asking . I got an anycall Samsung Galaxy s i9000 but after while it locked, can anybody help me with this. I’m using a Nokia 5800 KT Carrier in South Korea. I have trouble sending SMS overseas ( to Vietnam). Whenever my SMS is longer than 80 characters, it cannot be sent. I get an ERROR MESSAGE in Korean, but it had something to do with “MMS”. My guess is, SMS will be automatically changed to MMS if it’s longer than 80 chars, which can’t be received in Vietnam. I’ll try to provide you the ERROR MESSAGE in Korean later. But in case you have known the problem, please tell me how to fix it. Are Korean mobiles (Samsung) cheaper than in Thailand or Malaysia?? As in LOADS cheaper? Thanks. Hi, I just bought a 64G Galaxy Note 2 as the IP5 dock is not a friend of mine. I am looking for a Qi receiver that will fit in the Galaxy Note 2. I think the S3 receiver pad will also fit in the Galaxy Note 2. Samsung is dragging its feet on the whole wireless charging and LG seems to actually be in the lead ATM. Any ideas of who in Yongsan might be hiding these gems? Also, for my FOUR docks that used to snuggly accept 30 pin iphones, I just ordered a bluetooth dock to 30 pin dock adapter. Seen any in Korea yet?